© 2015 The Korean Society of Plant Pathology. Received January 20, 2015; Revised February 2, 2015; Accepted March 2, 2015. 2011년에 전북 정읍지역에 재배하는 쓴오이에서 탄저병이 발생하였다. 탄저병은 처음에 흑갈색의 작은 원형반점들이 잎과 열매에 나타났다. 감염된 잎과 열매는 작은 갈색-흑갈색 반점을 형성하고 병반이 커지거나 융합되어 큰 원형의 흑갈색 병반을 형성하였다. 탄저병 병징에서 분리한 병원균은 배양형태적 특성조사와 ITS rDNA 염기서열 분석결과 Colletotrichum gloeosporioides로 동정되었다. 분리된 C. gloeosporioides는 인공접종에 의한 병원성 검정에서도 동일한 병징을 나타내어 국내 처음으로 C. gloeosporioides에 의한 쓴오이 탄저병을 보고한다. Anthracnose occurred in bitter gourd grown in Jeongup areas of Korea in 2011. Anthracnose of bitter gourd appeared as dark brown circular spots on naturally infected leaves and fruits. The symptoms of infected leaves and fruits were small brown to dark brown spots and gradually enlarged to larger cylindrical dark brown lesions. 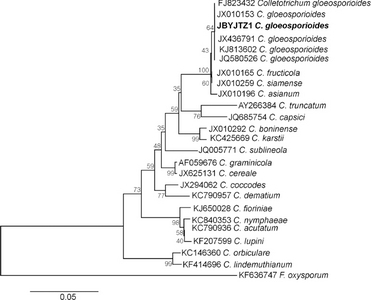 The causal fungus of anthracnose isolated from the diseased plants was identified as Colletotrichum gloeosporioides based on the morphological and cultural characteristics and ITS rDNA sequence analysis. All isolates of C. gloeosporioides produced symptoms on the host leaves by artificial inoculation. This is the first report of anthracnose on bitter gourd caused by C. gloeosporioides in Korea. 쓴오이(Momordica charantia L)는 여주라고 흔히 불리우며 일년생 덩굴성 초본류의 박과식물로 최근 항암, 항균제 등의 기능성 식물로 각광을 받으면서 재배가 점차 증가함에 따라(Bae, 2002) 예상치 못한 병해의 발생이 증가하고 있다. 2011년 8월, 전라북도 정읍의 쓴오이 노지재배 포장에서 잎과 열매에 탄저병이 발생하였다. 처음에는 흑갈색 원형 반점이 형성되기 시작하여 병반 주변으로 확대되면서 포장 전체적으로 발생이 점차 증가하였고 10월에는 열매에도 탄저병이 관찰되었다. 잎에 발생하는 탄저병은 초기에는 4.2%의 발병엽률을 보이다가 점차 증가하여 10월에는 전 잎에 탄저병 병징이 나타났으며 열매는 5%의 발생과율을 보였다(Table 1). aDiseased leaf rate (%) = number of diseased leaves/surveyed 200 leaves (10 leaves per plant/20 plant) × 100, diseased fruit rate (%) : number of diseased fruits/surveyed 100 fruits (5 fruits per plant/20 plants) × 100. 여주 잎에 발생한 탄저병 병징은 잎에 작은 황갈색-갈색의 원형 반점을 형성하고 점차 확대되어 주변 병반과 합쳐져 불규칙한 대형 병반을 형성하기도 하였다. 병반이 확대되면서 병반의 중심부는 구멍이 뚫리기도 하고 병발생이 심해진 잎은 갈변하면서 낙엽지기도 하였다. 또한 열매 수확기인 10월에는 열매의 가장자리부터 흑갈색 반점이 형성되며 습한 상태의 병반의 가운데는 분홍색 점질물을 띠기도 하였다(Fig. 1A-C). Symptoms of anthracnose on bitter gourd caused by Colletotrichum gloeosporioides in the field. 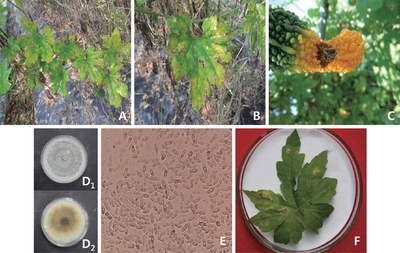 (A) Natural symptoms on leaves observed in the bitter gourd field, (B) closed-up symptom of leaf and (C) symptom of fruit. Morphological and cultural characteristics of C. gloeosporioides isolated from bitter gourd, the morphology of the front (D1) and back (D2) of the colony, (E) conidia (×400). (F) Symptom on bitter gourd leaf by artificial inoculation. 병원균은 2011년과 2012년까지 2개년 동안 여주 재배포장에 서 병징을 나타내는 시료를 수집하여 분리하였다. 탄저병에 감염된 잎과 열매의 병든 조직에서 5×5 mm 크기의 절편조직을 잘라 내어 1% sodium hypochlorite에 2분간 소독한 후 water agar(WA)에 치상하여 단포자를 분리하였다. 분리한 단포자는 potato dextrose agar(PDA) 위에 치상하여 5일간 25°C에 배양한 후 병원균을 분리 보관하면서 시험에 사용하였다. 분리된 병원균은 PDA 상에서 배양하면서 배양적·형태적 특징을 관찰하고 병원성검정을 조사한 결과 Colletotrichum gloeosporioides으로 동정되었다. 분리된 C. gloeosporioides는 PDA 배지 위에서 흰색을 띠는 균사를 형성하다가 점차 회색으로 변하여 진한 회색을 띠는 원형의 colony를 형성하였으며 10일간 배양한 후에 colony의 중앙에 오렌지색을 띠는 분생포자덩어리가 형성되었다(Fig. 1D1-D2). 분생포자는 무색의 격막이 없는 끝이 둥근 타원형으로 크기는 9.6?14.3×3.7?6.2(평균 12.1×5.1) ?m이었다. PDA 상에 서 강모와 균핵은 형성되지 않았다(Table 2, Fig. 1E). aThe data in parentheses indicate average of the measurements. 쓴오이의 잎과 열매의 탄저병 병반에서 분리한 C. gloeosporioides 균주의 병원성을 검정하기 위하여 분리 동정된 균주를 PDA 배지에 치상하여 25°C에서 14일간 배양한 후 멸균된 증류수로 배지상에서 자란 균주의 균총 표면을 긁어 모아 실험에 사용하였다. 병원균의 포자현탁액 농도는 1×106 conidia/ml으로 조정하여 사용하였다. 건전한 쓴오이의 잎과 열매에 멸균된 핀을 이용하여 상처를 낸 후 포자현탁액을 접종하고 대조구로 멸균수를 접종하여 시험을 실시하였다. 포자현탁액으로 접종된 식물은 포화 습도가 유지되는 생장상에 넣어 25°C에서 10일 간 유지하였다. 접종 10일 후 병징이 관찰되었다. 병원성검정을 위해 인위 접종된 쓴오이에 나타난 병징은 포장에서 관찰된 것과 동일한 병징을 나타냈으며(Fig. 1F), 그 병반에서 다시 처음에 접종했던 C. gloeosporioides 균주와 동일한 균들이 재분리되었다. 또한 이들 병원균은 Sutton(1980) 및 von Arx 등(1981, 1987)이 보고한 균학적 특징과 일치하였으며(Table 2), ITS rDNA의 염기서열을 분석하여 계통수를 작성한 결과 ITS(JBYJTZ1)의 염기서열은 C. gloeosporioides와 같은 계통군에 속했다(Fig. 2). Phylogenetic comparison of sequences with MEGA (ver. 6.0) of the ITS region of the our isolate with closely related strains and other species of Colletotrichum spp. The tree was constructed based on the neighbor-joining method with 1,000 replicates. The fungi identified in this study is boldfaced. C. gloeosporioides에 의한 탄저병은 국내에서 녹두, 콩, 고추, 딸기, 감귤나무, 감나무, 대추나무, 매실나무, 모과나무, 배나무, 복숭아나무, 블루베리, 사과나무, 서양배나무, 앵두나무, 참다래, 유자나무, 포도나무, 구기자나무, 두충, 들깨, 마, 산수유, 삽주, 시호, 알로에, 인삼, 천궁, 하수오, 관음죽, 데코라고무나무, 백량금, 벤자민고무나무, 쉐프렐라, 아레카야자, 에스키난서스, 장미, 종려, 켄챠야자, 팔손이나무, 협죽도, 네오레겔리아, 드라세나, 디펜바키아, 문주란, 스킨답서스, 스타티스, 스파티필룸, 시클라멘, 코스모스, 페페로미아, 홍학꽃, 덴드로비움, 삼각주, 손바닥선인장, 양란(심비디움), 팔레놉시스(호접란), 가래나무, 가시칠엽수, 누리장나무, 밤나무, 아까시나무, 오동나무, 유카리나무, 조팝나무, 진달래, 호두나무, 돌단풍, 비름, 소리쟁이, 쇠무릎 등 여러 작물에서 발생하는 것으로 보고되어 있다(The Korean Society of Plant Pathology, 2009). 인도에서 쓴오이 탄저병은 C. capsici에 의해서 발생하는 것으로 보고되었으며(Behera, 2010; Dubey와 Ekka, 2003), 쓴오이를 포함한 박과작물에 탄저병을 일으키는 병원균은 주로 C. lagenarium이나 C. orbiculare로 보고되어 있으나(Caruso와 Kuc, 1977), 중국에 서는 C. gloeosporioides에 의해 탄저병이 발생하는 것으로 보고(Wang 등, 2012)된 바와 같이 국외에서는 쓴오이 탄저병을 일으키는 균이 다양한 것으로 보고되어 있다. 그러나 본 연구에서 분리 동정한 C. gloeosporioides에 의한 쓴오이 탄저병은 현재 국내 미보고 균으로 처음으로 보고하고자 한다. Bae S. J. (2002) The effects on antimicrobial and anticarcinogenic activity of Momordica charantia L. Kor. J Nutr 35, 880-885. Behera T. K, Behera S, Bharathi L. K, John K. J, Simon P. W, and Staub J. E. (2010) Bitter gourd: botany, horticulture, breeding. Horticultural Reviews, Janick J (ed.) , pp.101-141. John Wiley & Sons, Inc, Hoboken, NJ, USA. Caruso F. L, and Kuc J. (1977) Protection of watermelon and muskmelon against Colletotrichum lagenarium by Colletotrichum lagenarium. Phytopathology 67, 1285-1289. Dubey S. C, and Ekka S. (2003) Integrated chemical management of Colletotrichum blight of bitter gourd. Indian Phytopath 56, 218-220. Wang H, Zeng X, Rui K, and Chen M. (2012) The preliminary study of biology characteristics and identification of Momordica in c harantia anthracnose L. Chinese. Agri. Sci. Bulletin 28, 141-145. Sutton B. C. (1980). The Coleomycetes , pp.696. Commonwealth Mycological Institute, England. The Korean Society of Plant Pathology (2009). List of plant diseases in Korea , pp.853. The Korean Society of Plant Pathology, Suwon, Korea. Von Arx J. A. (1981). The genera of fungi sporulating in pure culture , pp.222. J. Cramer, Vaduz, Germany. Von Arx J. A. (1987). Plant pathogenic fungi , pp.218-220. Gebruder Borntraeger, Berlin. Copyright © The Korean Society of Plant Pathology. All Rights Reserved.